Traditionally, a provider's office would send a long, paper survey to patients after their visit. The return rate on these surveys was poor, making it difficult for providers to determine their HCAHPS scores and whether patients were satisfied with their quality of care. The Cyder Discover product was originally built to collect patient satisfaction data electronically through an iPad in a kiosk format. The surveys were reduced to a 10 question, easy to read format with the goal of getting a better response rate to the surveys as patients were leaving the clinic. The results would immediately upload to a database allowing for real time assessment of the results on a backend application. Cyder approached me to help them improve the usability of the design to get Discover ready for Beta clients. At that point, I needed to look at the low hanging fruit that would have the most impact without taking a lot of the limited resources for development time. After doing a heuristic evaluation of the application, I organized a prioritized list of potential user stories that would improve the usability and get the product to a sellable Minimum Viable Product (MVP). Some of the stories were as simple as cleaning up terminology that nurses and nurse managers would understand. Other stories prioritized included: larger, more readable text on the survey, adding a progress indicator to the survey, showing the survey status in the backend application, and providing more meaningful data of the survey results without having to click around to find those results. In addition to providing improvements to get the tool to MVP, I also put together wireframes for improving the backend navigation and a patient profile page. The Discover platform has the potential to take on other screeners and provide a place for physicians to look at the Social Determinants that may affect a patient's health outcomes. I organized the potential data into focused categories and collected feedback on the concepts with a few nurse to determine whether the designs made sense to assess the patient based on this data. 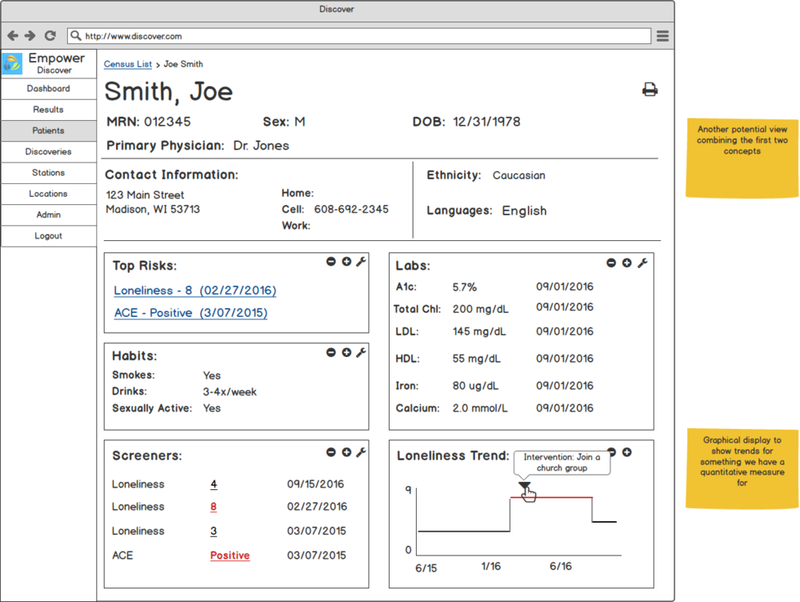 One design was based on data we were currently collecting from the patient screeners, while the second got into more of a "what if" we were able to integrate with an HIS system and bring in more data to help nurses and doctors make an assessment. A Patient Profile page focused on just screener information. Balsamic wireframe for a potential Patient Profile page. Cyder wanted to expand and collect additional patient screeners through the platform. We started exploration into a simple, 3-question screener to check patients for loneliness. Patients that score high on the screener are less likely to keep up on their care and have the potential to be a high risk patient within the population. I put together a Sketch/InVision prototype of how the patient screener would work for patients in order to get design feedback from clinicians and potential patients on the readability of the questions. The facial expressions were added to help out those patients that have lower health literacy levels. Sketch/InVision screen shot of the Loneliness Screener on an iPad.